Out of this world landscapes! From rivers of red to luna landscapes, marble caves to a pyramid of ice, and everything in between, these are the most incredible and bizarre natural wonders of South America! Some of the most well-known natural wonders of the world are in South America… the incredibly beautiful harbour of Rio de Janeiro, the mammoth Iguazu Falls, and the mirror-like Salt Flats of Bolivia, but there are plenty of lesser-known landscapes on the continent which are equally impressive. From rivers of red to luna landscapes, marble caves to a pyramid of ice, and everything in between, these are the most incredible and bizarre natural wonders of South America! No filter required for these incredible slopes! The mountains of Hornocal are one of Argentina’s least-visited natural wonder, due to their isolated location in the high altitude, northern plains of the country. 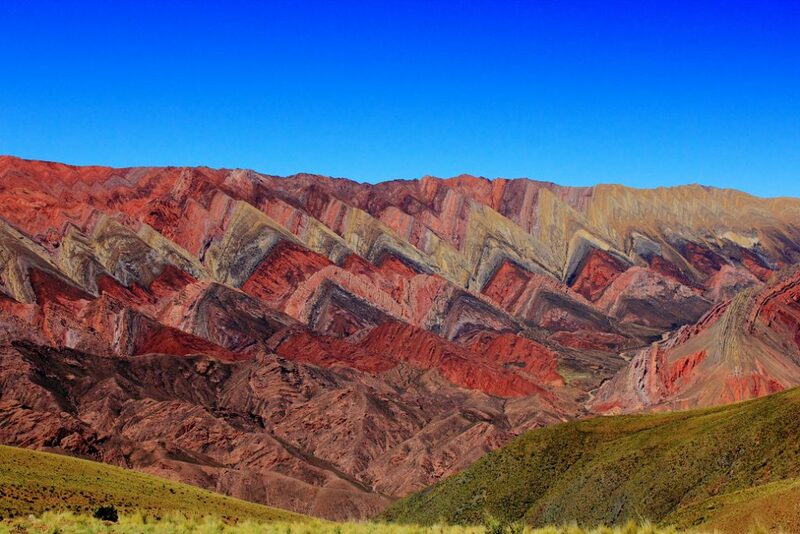 Located at 4,300 metres above sea level, these multi-coloured hills are an ancient limestone rock formation, which actually extends all the way through northern Argentina, Bolivia, and into Peru. The area is of great geological interest, not just because of the serranias fascinating colours, but also because many interesting dinosaur fossils have been found there. How to Visit: The 4 hour route from the tourist hub of Salta to Hornocal is inaccessible by car, and should only be undertaken in a 4×4 with a professional guide, as the road is notoriously dangerous. The nearby Hill of Seven Colors in Purmamarca is an easier to reach alternative, although less impressive. The impressive Perito Moreno Glacier is a UNESCO World Heritage site covering 100 square miles, and it is nearly 20 miles in length! It’s the third largest fresh water reserve on the planet, and one of 47 glaciers in Argentina’s largest national park, Los Glaciares. The ice field itself is constantly expanding, despite global climate change, and huge chunks of ice regularly break off as the glacier continues to push forward. 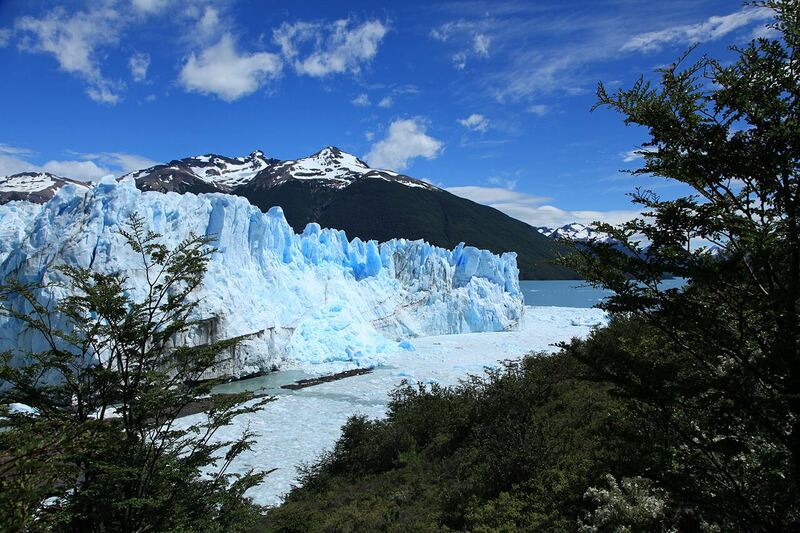 How to Visit: Perito Moreno is just a short drive from the charming city of El Calafate. It’s also accessible from Torres del Paine National Park on the Chilean side of the border. Ice treks are a great way to actually walk on the glacier, although the best views are from the walkways. The Moon Valley, or El Valle de la Luna, in the Chilean Atacama Desert is one of the driest places on earth. In fact, in some areas of the valley it hasn’t rained for hundreds of years. The dry atmosphere and strong winds have carved an incredible, other-worldly landscape, with jagged rock formations and beautiful salt lakes. The terrain is so bizarre that NASA have used it as a testing site for a Mars Rover! 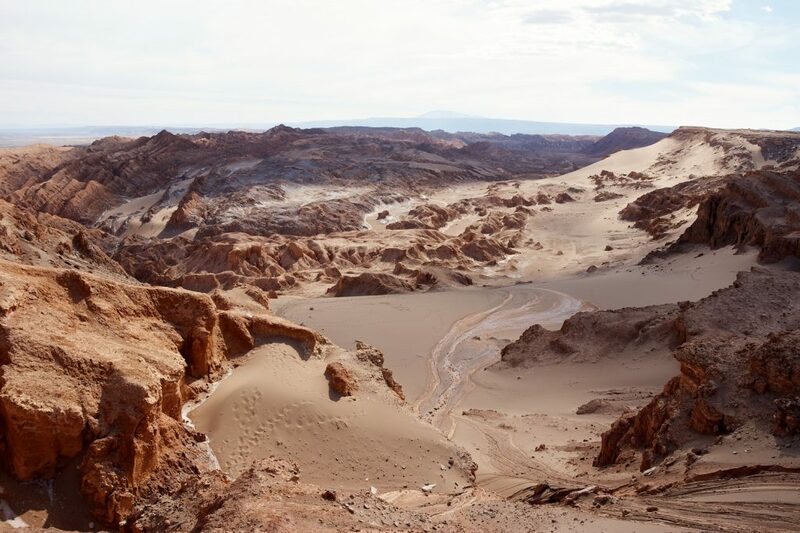 How to Visit: The Moon Valley is only a few miles west of the town of San Pedro de Atacama, the base for exploring the Chilean desert. The area is best explored on an evening, when the fading light brings out the multi-coloured tones of the rocks, and the volcanic peaks are lit-up from behind by the setting sun. Mount Roraima really has to be one of the most impressive natural wonders of South America… The mountain is actually a tepui plateau, a table-top landscape of 12 square miles, raised up by 400 metre cliffs on every side. The 2,800 metre summit is often shrouded in clouds, giving it an ancient, mystical appearance. These bizarre rock formations are thought to be some of the oldest on the planet, roughly dating back over 2 billion years ago. 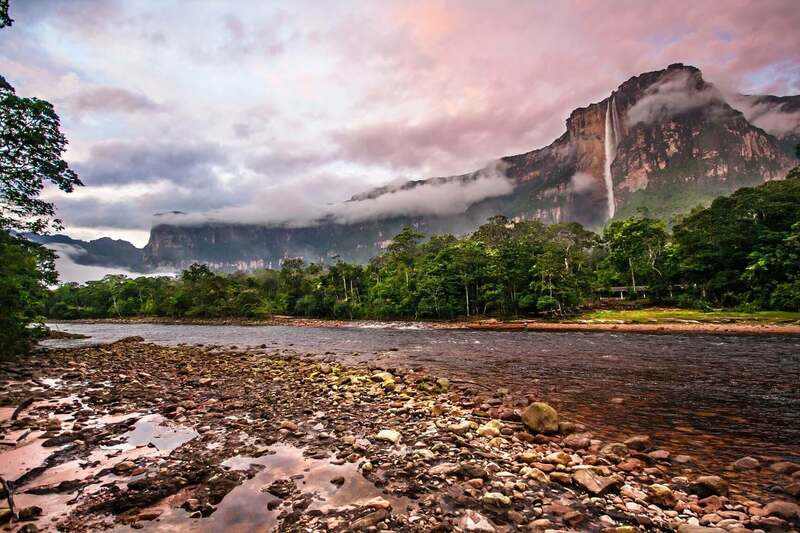 The area is home to the world’s tallest waterfall, Angel Falls, which cascades nearly 1,000 metres down the tepui into Canaima National Park. How to Visit: The National Park can be reached by plane from the capital city, Caracas, and from there you can join a tour to explore with a professional guide. The top of the tepuis can only be reached by experienced climbers, but a helicopter flight over the plateaus is a good alternative. 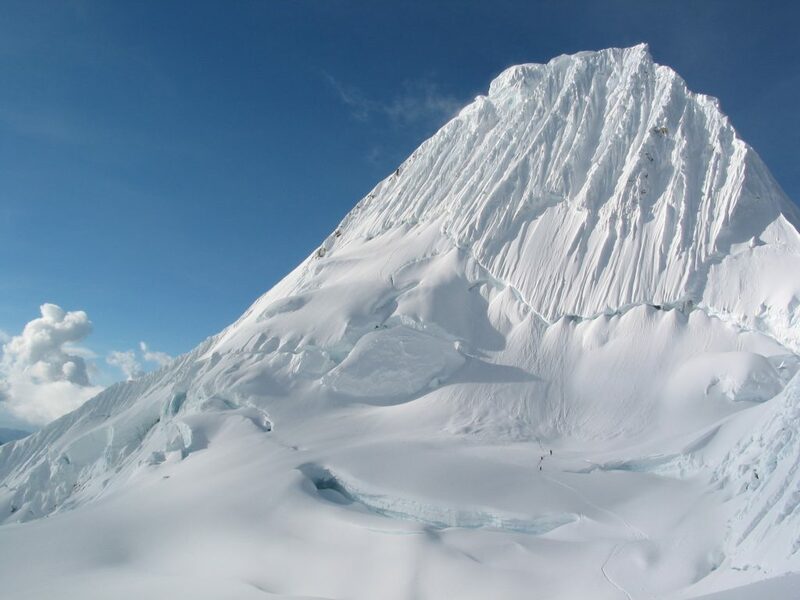 Alpamayo is a steep mountain in the Cordillera Blanca region of Peru. It’s 60 degree incline and thin conical summit give it the appearance of a pyramid, and it has been named the most beautiful mountain on the planet a number of times. Although Alpamayo is not the highest mountain in the area, the 6,000 metre climb is one of the toughest and is only suitable for experienced mountaineers. It takes 2-3 days to reach base camp, and over half of climbers don’t make it to the summit. How to Visit: Alpamayo is located in the Andean Mountain range just north of Huaraz. Although the summit climb is unsuitable for most visitors there are plenty of easier treks in the area. 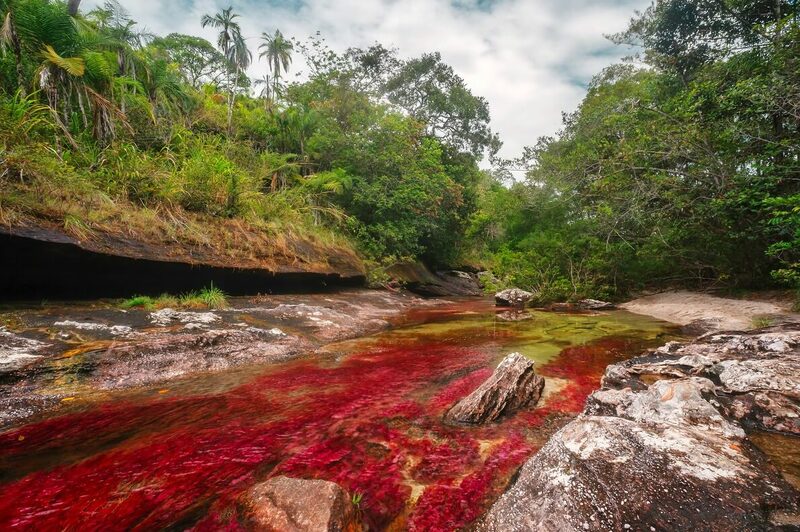 For most of the year, the Caño Cristales River, located in the biodiverse area between the Amazon Rainforest, the Andes, and the Orinico region, would not be considered a natural wonder of South America. But between July and November, the riverbed is covered with a blanket of colourful algae, causing the water to turn into a liquid rainbow. This phenomenon adds to the already tropical, lush beauty of the country’s most biodiverse national park, where you can swim in cool waterfall lagoons and spot everything from jaguars to cougars! How to Visit: To help conservation efforts, there is a daily limit on the number of tourists allowed to visit Caño Cristales, and to do so you must book through a tour operator. La Macarena is the closest airport, which can be reached from Villavicencio or Bogota. One of the top hiking destinations in the world! 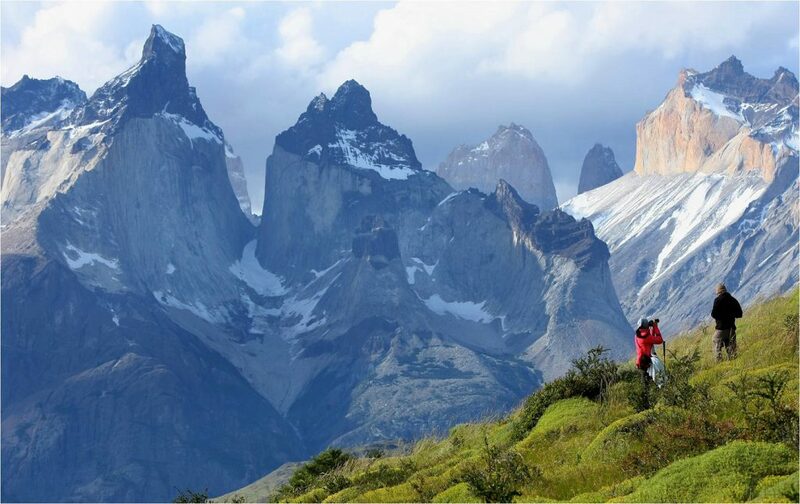 Patagonia is becoming more and more well-known, due to recent television documentaries and media exposure, and we’re not surprised! The National Park, which lies in southern Chile on the border with Argentina, has some of the most breathtaking mountain backdrops in the world. The 3 sharp granite peaks, or Paine Massif, tower nearly 2,500 metres above the park, which is filled with beautiful blue lakes, lush forests, and glaciers. How to Visit: The tourist infrastructure in Patagonia is really good; there are some great accommodation options within the National Park, which most people travel to from the airport hub of Punta Arenas. Puerto Natales is a good base for day trips, and tours are also possible from El Calafate in Argentina. 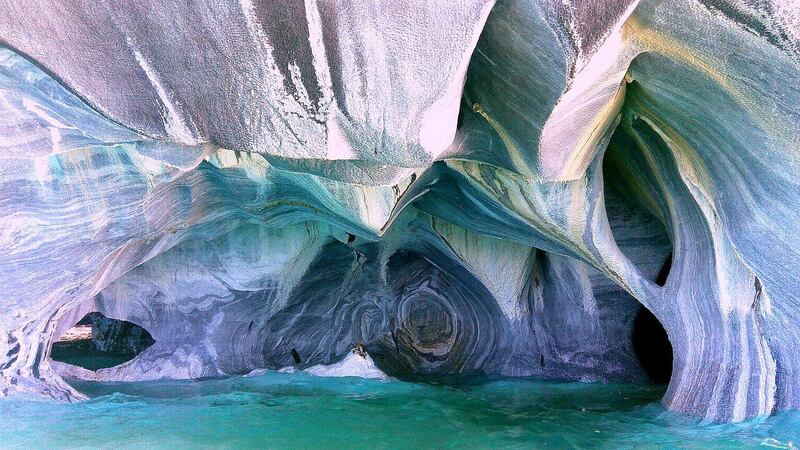 The Marble Caves are located in Southern Chile on Lake General Carrera, which also falls into Argentinean territory. The caves were formed over 6,000 years, as waves carved out tunnels through the vast marble monoliths than are dotted around the lake. The most impressive is the Marble Cathedral, which resembles a vaulted ceiling. The striking colours of the caves are enhanced by the clear blue water of the lake, and are best observed during the morning, when the sun is low but bright. How to Visit: The Lago General Carrera region is as beautiful as the rest of Patagonia, but it is fairly isolated and a long drive from the nearest city, Coyhaique. Puerto Rio Tranquilo is the best base for doing a guided boat trip to the caves, although we recommend renting a kayak. The best landscape to showcase your creative photography skills! 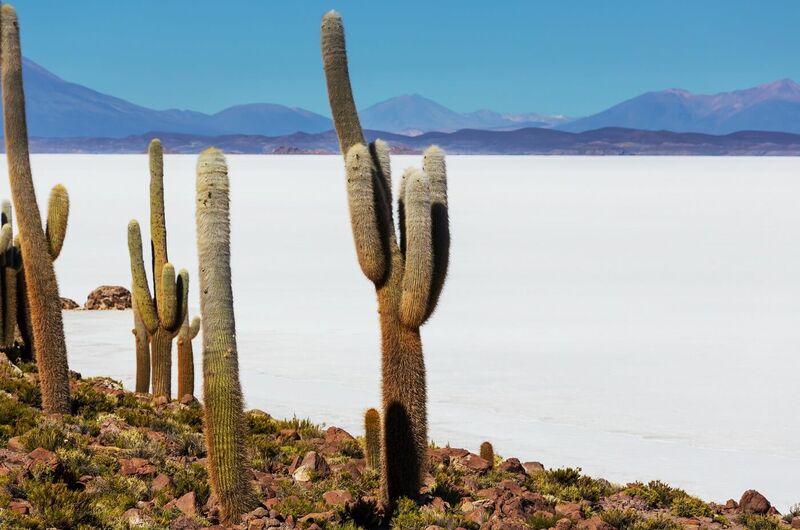 It’s one of the most visited natural wonders of South America, which is no surprise considering the Bolivian Salt Flats are the largest and most impressive in the world. They are located in the remote Altiplano which links Bolivia with the Atacama Desert, at around 4,000 metres above sea level. The flats used to be part of a prehistoric lake which dried up thousands of years ago, leaving behind brightly coloured mineral pools and islands covered in cactus. After the wet season, in March and April, the salt flat acts a giant mirror, making for fantastic photo opportunities! How to Visit: Uyuni is the point for the salar, and is connected to La Paz by regular flights and bus routes. Here is some more information on the different routes to Uyuni. The National Park of Lençóis Maranhenses covers almost 600 square miles, and resembles some kind of white sand desert of rolling sand dunes. Despite its proximity to the lush Amazon Basin, the area has almost no vegetation or wildlife. It might sound bleak, but this inland beach comes alive between July and September when it is hit by tropical rains. The sand dunes create basins which collect the fresh water, creating brightly coloured lagoons, interconnected to each other and nearby rivers. These pools fill with fish in the wet season, and incredibly some species lay dormant in the muddy sand throughout the year until the rains hit. 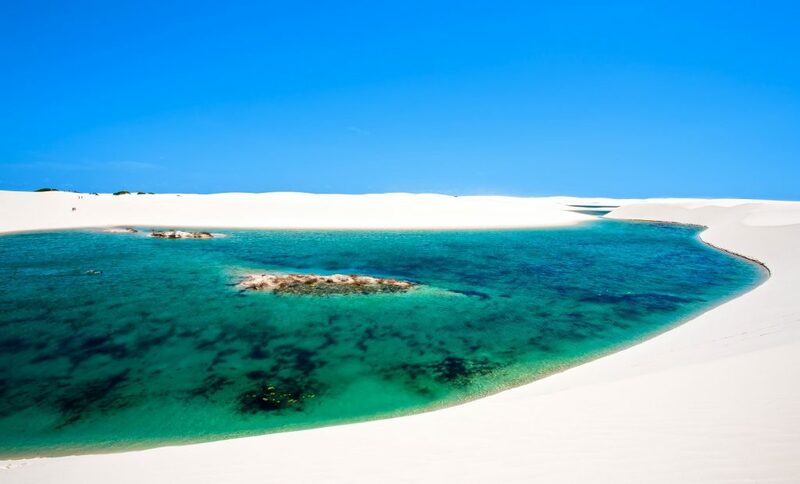 How to Visit: Barreirinhas or the small village of Atins in the Northeast of Brazil are the base camps for Lençóis Maranhenses, which is about 160 miles away from the nearest big town, São Luís. The continent has some of the most biodiverse landscapes on the planet, and there are too many natural wonders of South America than can be mentioned in a single blog post. From the stunning islands of the Galapagos to the lush plains of the Pantanal wetlands, there is so much to be explored! Next post Things You Never Knew About Llamas!